That time of year has come around again when we are in the lead up to Remembrance day Sunday and we are selling poppies for the British Legion. The British Legion help serving members of the Armed Forces, ex-Service men and women and their families, now and for the rest of their lives. They provide practical care, advice and support to the Armed Forces family all year round. Neil and I do door to door collecting in a very rural part of Buckland St Mary, where there are lots of farms and we have to go down farm tracks to arrive at the house to sell poppies. We only do about 30 houses but it took us 3 hours on Saturday and then we went back on Sunday morning to try and catch the houses where the people were out on Saturday, so that took another 2 hours. Mind you some of it is chatting to the people we meet, but that’s part of the job. 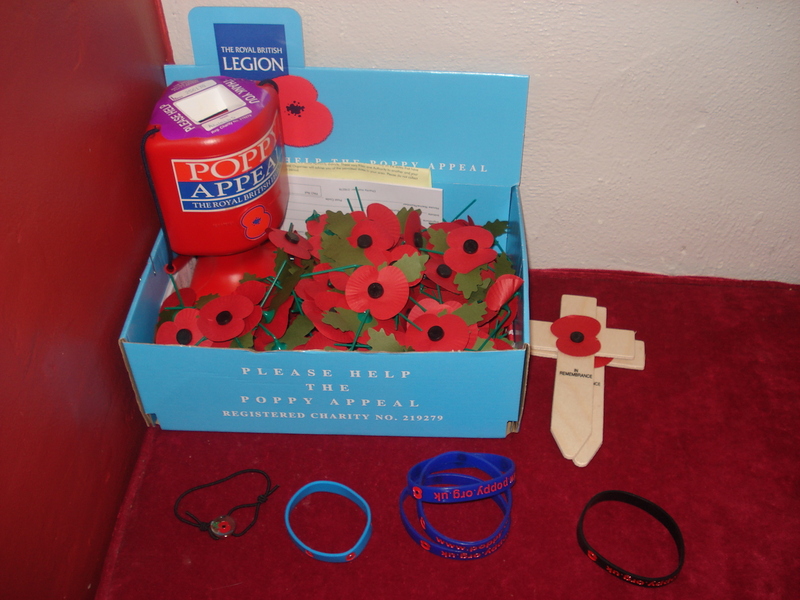 This year we had wrist bands of various colours and sizes to sell as well as poppies and crosses. We managed to get all but 6 houses where we couldn’t get a reply so hopefully will have done quite well. The Remembrance Day Sunday service is 3pm at Buckland St Mary church on Sunday 10th November. We still have some vacancies in the B&B for November. Here in the UK Sunday 11th November is Remembrance Sunday, when we remember all the fallen heroes of past wars, together with the injured from recent and current wars. The Royal British Legion is the UK’s leading Service charity. It provides practical care, advice and support to serving members of the Armed Forces, veterans of all ages and their families. It does fantastic work supporting service personnel and their families and is an organisation that has been going for many years here. 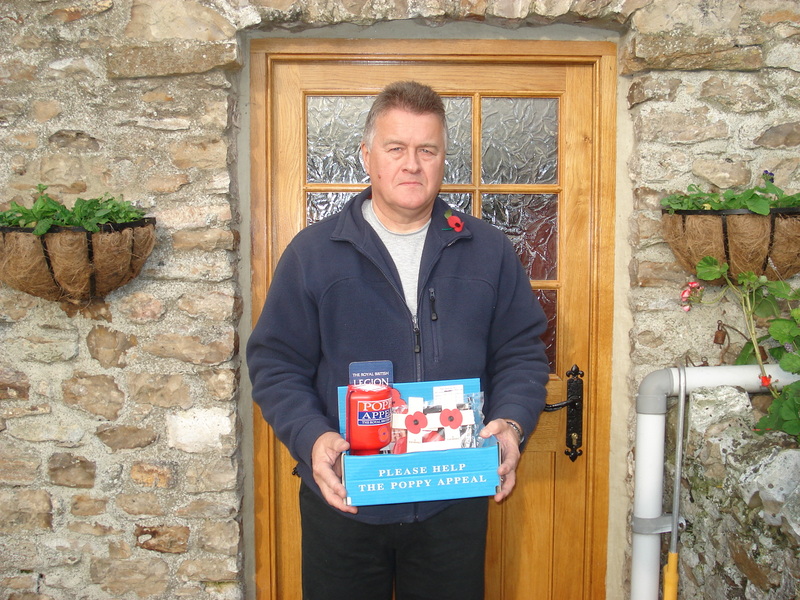 The Poppy Appeal is the Legion’s biggest fundraising campaign and runs year-round. Lapel poppies are available to buy in shops, supermarkets, pubs and clubs from the last week of October until Remembrance Sunday, or 11th November, whichever is later in the calendar. It takes 350,000 volunteers and staff to organise the Poppy Appeal each year. More than 40 million Remembrance poppies, 500,000 poppies of other types, 5 million Remembrance petals, 100,000 wreaths and sprays, 750,000 Remembrance Crosses and other Remembrance items are made at the Poppy Factory each year. The 2010 Poppy Appeal raised a staggering £36 million, smashing all previous records. This target for the 2011 Appeal (October 2011 to September 2012) is £40 million. And we are doing our bit. Today we went out selling poppies door to door. Our round is a very rural round called Hare Lane in Buckland St Mary and Dommett. There are quite a few farms down long tracks and the houses are sparse, so it took us 2 hours to do about 30 houses. This year we were given a sash to wear, but as you can see it kept slipping off my shoulder so I abandoned it pretty early on. We shall be out again tomorrow doing the houses where no one was in this morning, and I am hoping we can raise more money than last year. 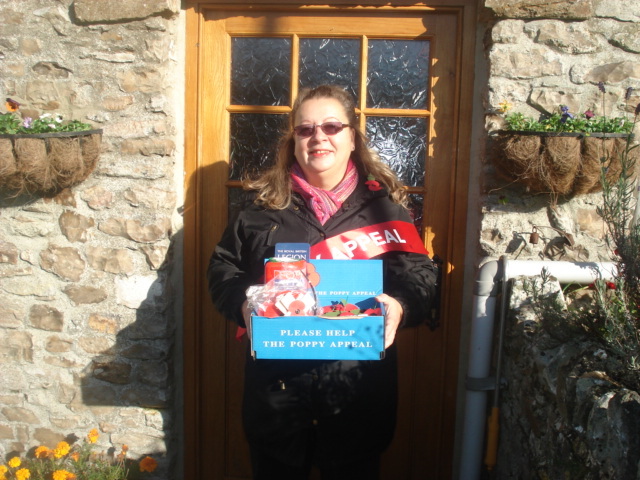 Neil and I were volunteered this year into door to door poppy collecting for the British Legion. We have never done this before but took up the challenge and were assigned a rural patch with several farms and a few houses. Even so the first day we went out it took us two and a half hours to go around, as where we found people at home, they mostly stopped to talk. The lady who organises poppy collection in this area sends out 50 boxes with various people. She has to make each box up, then collect them all in, count up the money, and bank it, so quite a job. 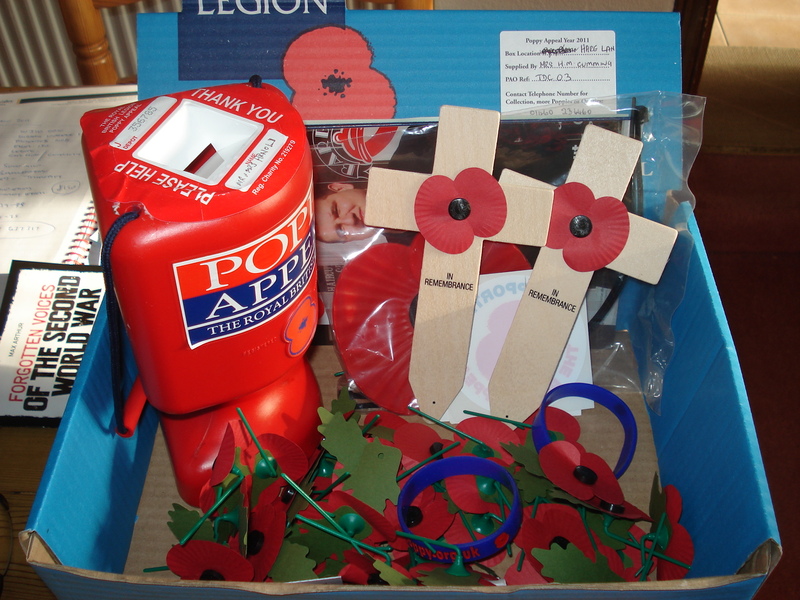 In our box we had normal poppies, car stickers, wrist bands, wooden crosses, a large car poppy and a collection tin. The wristbands seemed popular with the youngsters, but most people bought a normal poppy, and many people were very generous. Yesterday was Remembrance Sunday in the UK and in Buckland St Mary, like many churches throughout the country we had a Remembrance Day service. Ours was 3pm in the afternoon and for a small village there was an excellent turnout. When we went outside to the cenotaph we had 2 local trumpeters to play the last post and then the revielle. Then we all retired to the back of the church for tea and cake and a natter. It’s very good to see the community coming together for such an event.